Anyway, I don’t think I can get behind this (and the dumb jokes continue, folks! ), but this might be useful to someone . . . somewhere. Those dudes who still wear fanny packs? Maybe. 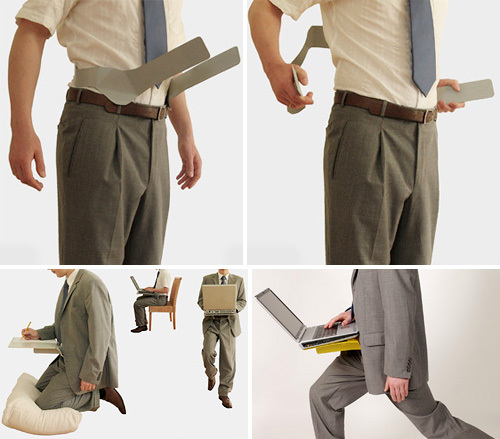 It’s still a concept, so you don’t have to fear getting hit by a Hip Desk attached to an office drone out on the street quite yet. I think it’s _________. See my comment below! So, it looks like Sony is nixing the 80GB PS3. But not for single model simplicity. Shnope, Sony is introing a re-juiced, re-jiggered top SKU: Ars’ fairly reliable source says that the new box will be packed with a 120 or 160GB hard drive and a Dual Shock 3, which is due our on side of the lake in fairly short order. No, it’s not really called the PS3 Elite. I hope.